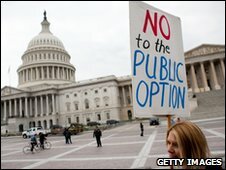 The US Senate has narrowly voted to hold a full debate on a landmark bill designed to overhaul the country's healthcare. All 58 Democrats, plus two independent senators, approved it. All but one of 40 Republican senators voted against. Two Democratic senators whose support had been in doubt earlier said they would back the package, a key election pledge of President Barack Obama. The White House said Mr Obama was "gratified" by the result. 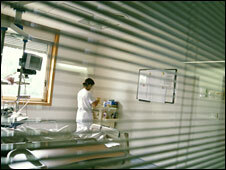 A full Senate debate on healthcare reform will now begin on 30 November. US healthcare: Who wants what? The House of Representatives narrowly passed its own version of the reforms earlier this month. Senate Democratic leader Harry Reid says his $849bn (£508bn) bill would extend coverage to another 31 million people, or 94% of eligible citizens. The legislation, which was outlined in a 2,074-page document, is said by Democratic aides to reduce deficits by $127bn (£76bn) over a decade and by as much as $650bn (£389bn) in the 10 years after that. But Republicans say it will be too expensive, and have vowed to block it. Fewer than 60 votes for the initial measure would have left the bill vulnerable to Republican delaying tactics. A White House spokesman said President Obama was "gratified that the Senate has acted to begin consideration of health insurance reform legislation". "Tonight's historic vote brings us one step closer to ending insurance company abuses, reining in spiralling health care costs, providing stability and security to those with health insurance, and extending quality health coverage to those who lack it," said Robert Gibbs. 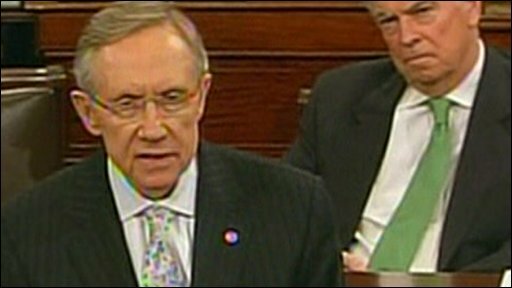 Speaking after the vote, Mr Reid said he was looking forward to the coming debate and to "finally bringing quality health care to the American people". But Republican Senate leader Mitch McConnell said he would continue to oppose the motion. "The American people are asking us to stop this bill and we're going to do anything and everything we can to prevent this measure from becoming law," he said. Efforts to get the vote passed had focused on three centrist Democrats - Ben Nelson of Nebraska, Blanche Lincoln of Arkansas and Mary Landrieu of Louisiana - who expressed doubts about the bill. Sen Nelson said on Friday he would back the procedural vote, but Senators Lincoln and Landrieu declared themselves available only hours before it was due to take place. After confirming her support, Sen Lincoln said that it was important to start debating the issue and that Saturday's vote would "mark the beginning of consideration of this bill by the US Senate, not the end". Senator Landrieu said there were "enough significant reforms and safeguards in this bill to move forward, but much more work needs to be done". All three Democrats continue to have deep reservations about the bill. People would also be able to take part in new insurance market places and be able to choose to buy government-sold insurance from 2014, a provision intended to help regulate the prices charged by private companies. Large companies would be required by law to provide coverage to staff. The costs would be covered by government cuts on future Medicare spending. If the Senate eventually passes its bill, it must then be reconciled with the House of Representatives bill and voted on again before the programme can become law. Mr Reid's bill differs to the House bill in that he calls for an increase of a half percentage point in Medicare payroll tax for people with an income of over $200,000 (£119,779) per annum - rising to $250,000 (£149,724) for couples. There is also a tax on high-value insurance policies that is not contained in the House version of the bill.